CABSTOP in your street, taxi bookings with a tweet. All you need is your CABSTOP code. Enter your address to get your code. Don’t worry, this form will not book you a taxi. Click here if your address does not appear in the list. How do I create my CABSTOP code? How do I book a cab using CABSTOP? How do I book a cab using Twitter CABSTOP? How do I know my CABSTOP booking has been created? How long will my cab take to arrive with CABSTOP? How do I check on my CABSTOP booking? How do I cancel my CABSTOP booking? How much will my CABSTOP fare cost? How much does sending a CABSTOP SMS cost? Can I use CABSTOP to place a booking for a later time? Can I use CABSTOP to book more than one cab at a time? Can I use CABSTOP if I have five or more passengers? Can I use CABSTOP if I require a station wagon? Can I use CABSTOP if I require Silver Service? Can I use CABSTOP if I require a parcel booking? Can I use my CABSTOP code when I am not at home? What if I can’t remember my CABSTOP code? How long will it take to get my CABSTOP code? Can I choose my CABSTOP code? Can I have letters in my CABSTOP code? How much does my CABSTOP sign cost? What happens to my CABSTOP if I change addresses? Can I have multiple CABSTOP codes for the same address? Will my CABSTOP code work with a taxi company besides 13CABS or Taxis Combined? Can I use CABSTOP outside of New South Wales, South Australia and Victoria? Can I use CABSTOP from my iPad or other tablet devices? Can I use CABSTOP from my iPhone? Can I use CABSTOP from my Android phone? Can I use CABSTOP from my Windows Phone 7? Can I use CABSTOP from my Blackberry? Do I need a special program to view my CABSTOP sign? Your CABSTOP code will be created in a matter of seconds. Paul on 03 9277 3702 or Matthew on 03 9277 3708 . CABSTOP codes currently consist of numbers only. You can have your CABSTOP code in a matter of seconds. You will get your code straight away when your enter your address on the CABSTOP website. When you get your CABSTOP code a sign is automatically generated. You can print, save or share it straight away. SMS your CABSTOP code to 0431 13 2227. You will be sent a confirmation SMS with your booking number. You will be sent a confirmation SMS with your booking number once your CABSTOP booking has been created. To check on your CABSTOP booking call 13 CABS (13 2227) in Adelaide, Melbourne and Newcastle or 133 300 in Sydney. One of our friendly operators will update you on the progress of your booking. If you are not picked up 15 minutes after you create your CABSTOP booking we recommend you call 13 CABS (13 2227) in Adelaide, Melbourne and Newcastle or 133 300 in Sydney. One of our friendly operators will be able to update you on the progress of your booking. SMS 'cancel' to 0431 13 2227. You will be sent a confirmation SMS for your cancellation. CABSTOP currently only places bookings for straight away. If you require a booking for a later time call 13CABS (13 2227) in Adelaide, Melbourne and Newcastle or 133 300 in Sydney. One of our friendly operators will place the booking for you. download the 13CABS App, available on iPhone, Android and Windows Phones 7 and 8 devices. CABSTOP currently only places one booking at a time. If you require multiple cabs call 13 CABS (13 2227) in Adelaide, Melbourne and Newcastle or 133 300 in Sydney. One of our friendly operators will place the booking for you. CABSTOP is currently only available for sedan and Wheelchair Access Taxi bookings. If you require a High Occupancy Vehicle call 13 CABS (13 2227) in Adelaide, Melbourne and Newcastle or 133 300 in Sydney. One of our friendly operators will place the booking for you. CABSTOP is currently only available for sedan and Wheelchair Access Taxi bookings. If you require a station wagon booking call 13 CABS(13 2227) in Adelaide, Melbourne and Newcastle or 133 300 in Sydney. One of our friendly operators will place the booking for you. CABSTOP is currently only available for sedan and Wheelchair Access Taxi bookings. If you require a Silver Service booking call 13 CABS(13 2227) in Adelaide, Melbourne and Newcastle or 133 300 in Sydney. One of our friendly operators will place the booking for you. CABSTOP is currently only available for sedan and Wheelchair Access Taxi bookings. If you require a parcel booking call 13 CABS (13 2227) in Adelaide, Melbourne and Newcastle or 133 300 in Sydney. One of our friendly operators will place the booking for you. CABSTOP codes are unique to the address they are created for. If you are often picked up from a different address, just create another code for that address. CABSTOP is a booking feature provided exclusively by 13CABS, a taxi booking company servicing the greater Adelaide, Melbourne and Newcastle areas, and Taxis Combined, a taxi booking company servicing the greater Sydney areas. One of our friendly operators will provide you with an estimate. 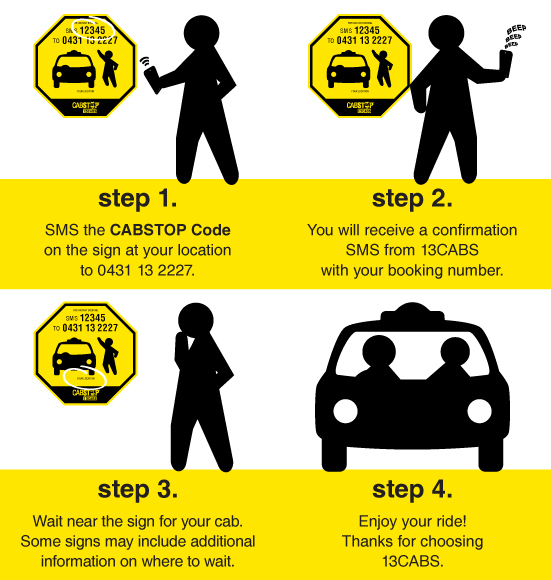 CABSTOP is a product exclusive to 13CABS in Adelaide, Melbourne and Newcastle. In Sydney CABSTOP is a product exclusive to Taxis Combined. CABSTOP can currently only be used from devices capable of SMS. If your iPad or tablet device does not support SMS, call 13 CABS(13 2227) in Adelaide, Melbourne and Newcastle or 133 300 in Sydney. One of our friendly operators will place the booking for you. Yes. CABSTOP can be used from any device capable of SMS. Alternatively download the 13CABS iPhone App. Alternatively download the 13CABS Android App. The price of sending an SMS to CABSTOP depends on your mobile plan. Many plans include free SMS, in which case there will be no cost. The cost is no more than a standard SMS. You are only charged for SMSs you send, not confirmation SMSs received from 13CABS. You can have one standard CABSTOP code and one Wheelchair CABSTOP code for the same address. Your code is unique to the address it is created for and will be the same every time. Enter your new address on the CABSTOP homepage. You will have a new code generated for your new address. Your CABSTOP sign is a PDF file and you will need PDF Reader to view it. Most browsers include an inbuilt PDF reader. If you are unable to view your CABSTOP sign you can download the Adobe Reader here . A 13CABS representative will contact you as soon as possible.